The premier book in the new Ken Blanchard Series Describes a simple approach and system for getting a steady flow of new business through referrals from existing customers-no more cold calls! Nobody likes cold calls. And nobody really needs to make them. The Referral of a Lifetime teaches a step-by-step system that will allow anyone to generate a steady stream of new business through consistent referrals from existing customers and friends and, at the same time, maximize business with existing customers. Your customers and clients already know every new contact you will ever need to succeed-by applying Tim Templeton's system they will naturally refer them to you. The Referral of a Lifetime uses an entertaining fictional story to emphasize the importance of "putting the relationship first"-building an ongoing relationship with customers based on genuine respect and caring, rather than just making the sale and moving on. More than just teaching a system for increasing business success, The Referral of a Lifetime crystallizes people's desire to practice "the golden rule" in business and to be accepted as a professional with integrity and character. This straightforward and powerful book will ultimately change the way you look at all the relationships in your life. 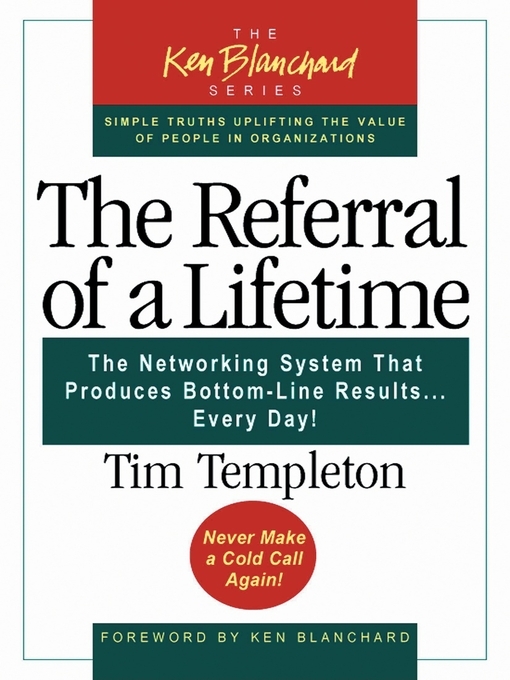 The Referral of a Lifetime is the first book in the brand new Ken Blanchard Series. Each book in this series will be hand-picked and introduced by Ken, and will offer simple truths and profound wisdom in Ken's trademark storytelling style.